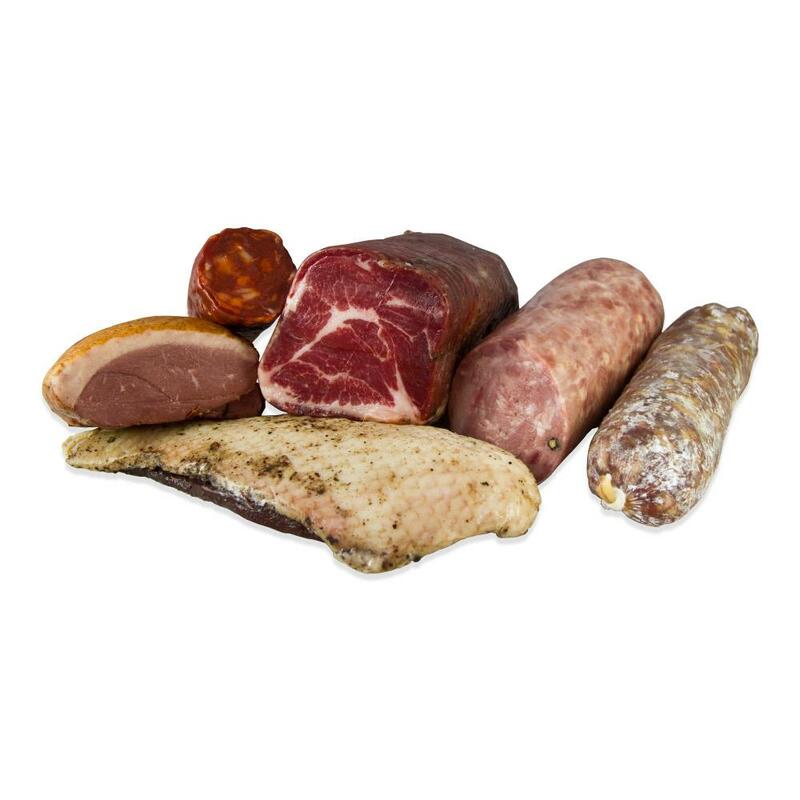 Whether you’re planning a party or just a big fan of cured meats, these samplers offer a delicious selection of options. Two sizes are available: a four-item small sampler and a six-item large sampler. All these items have been expertly prepared and offer tremendous flavor. Smoked Magret Duck Breast: Moulard Duck Breast (Magret), Water, Salt, Sugar, Dextrose, Sodium Erythorbate, Sodium Phosphates, Garlic, Sodium Nitrite. 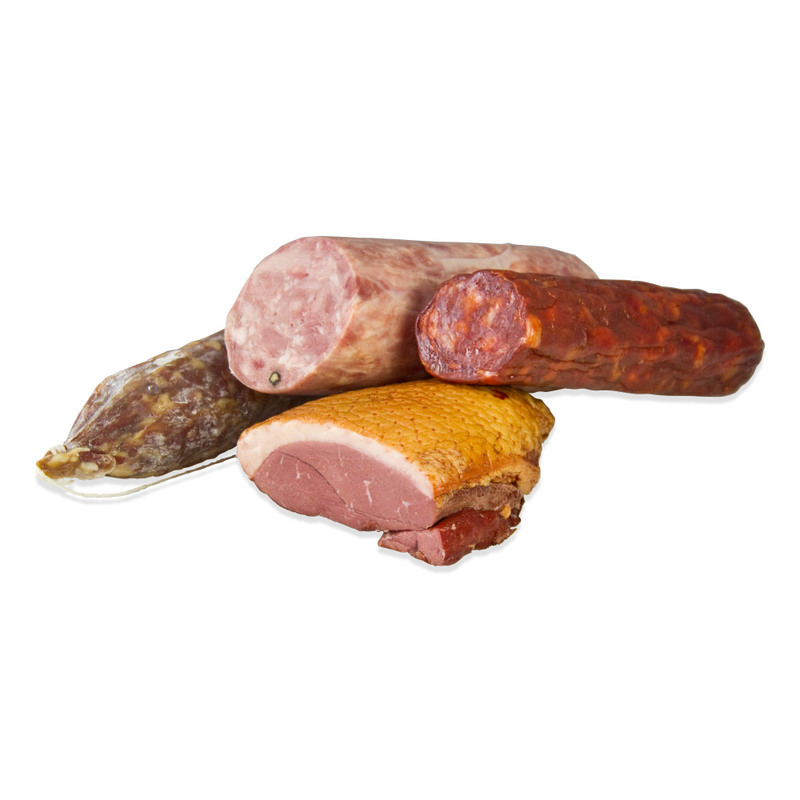 Saucisson Sec: Pork, Salt, Dextrose, Spices, Lactic Acid Starter Culture, Rice Starch, Sodium Erythorbate, Garlic, Sodium Nitrite, Beef Casing. Chorizo d’ Espana: Pork, Salt, Paprika, Dextrose, Spices, Garlic, Lactic Acid Starter Culture, Sodium Erythorbate, Sodium Nitrite, Collagen Casing. Garlic Sausage: Pork, Water, Salt, Nonfat Dry Milk, Garlic, Sugar, Pepper, Spices (allspice, coriander, nutmeg, caraway), Granulated Garlic, Ascorbic Acid (Vitamin C), Sodium Nitrite, Collagen Casing. Coppa: Pork, Salt, Sugar, Spices, Sodium Erythorbate, Sodium Nitrite, Garlic Powder, Beef Casing. Duck Prosciutto: Duck Breast, Sea Salt, Mixed Peppercorns, Brown Sugar, Fresh Garlic, Sodium Nitrite. Storage: Store dry cured meats in your refrigerator. For long term storage they can be frozen, but this may affect their texture. Smoked Magret Duck Breast: Up to 8 weeks. Garlic Sausage: Up to 8 weeks. Saucisson Sec: Up to 12 weeks. Chorizo d’ Espana: Up to 24 weeks. Coppa: Up to 24 weeks. Duck Prosciutto: Up to 36 weeks. All items will keep for up to 10-14 days in the refrigerator after they’ve been opened, and up to 36 weeks if they are frozen. Dry cured meats are delicious sliced thin for sandwiches, pizza, charcuterie platters, cheese plates, and appetizers. They can also be used as an ingredient (cubed or sliced) in salads, soups, and other dishes. Smoked duck breast is a particularly delicious addition to salads and paper-thin slices of coppa are a great pizza topping. Peeling the casing off of the saucisson & chorizo d’ espana prior to eating them is recommended (it's easiest to do this after slicing).